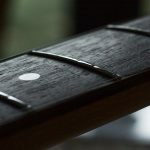 Scale length for bass guitars can be a rather grey area due to the huge variation of basses and strings on the market today. 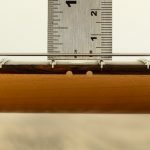 As with all things strings and musical instruments, there’s often some idiosyncrasies that throw curve balls into the mix so we’re here to help clear things up and guide you as you navigate your way through the (sometimes) murky waters of scale lengths. So what exactly is scale length? Scale length is the distance (usually measured in inches) from the bridge saddles of your bass up to the nut. You may have heard scale length referred to as “speaking length” at some point. These two terms are NOT interchangeable and refer to two different things; here at Strings Direct we prefer to use speaking lengths and we’ll explain why a bit later on. Not all bass scale lengths are the same so they are generally categorised into 4 main groups; short scale, medium scale, long scale, and extra-long scale. It’s worth noting that these measurements are meant as a guide only. Unfortunately, there aren’t any firm “rules” on scale length that bass and string manufacturers stick to and as a result we often end up with conflicting interpretations of scale lengths where the length of one brand’s set will be longer than another brand’s, and vice versa (this is true for all scale lengths, not just long scale so it’s definitely something you should try to be mindful of). What do I need to know about my bass? Here at Strings Direct, we know all too well about the issues players have when selecting the correct length of strings for their bass. Whilst it’s important to be aware of your scale length (short, medium, long etc… ), more importantly, we encourage bassists to know how long they need their strings to be, which will be a slightly longer measurement than basic scale length, aka Speaking Length. To find this out, rather than simply measuring from the bridge to the nut, we insist players measure their current set of strings (if your bass has a set on there) from the ball end of the string to where it crosses the nut. If you have a bass where you cannot see the ball end i.e. a thru-body bass, you will have to do this exercise once the string has been removed. If you do need to do this, before removing the string be sure to make a mark on the string with a permanent marker just behind the nut so you know where to measure up to. Knowing this measurement will always stand you in good stead for getting the right length of bass strings. Well this distance will be the minimum length your strings need to be before any silk wrap or tapering should start. 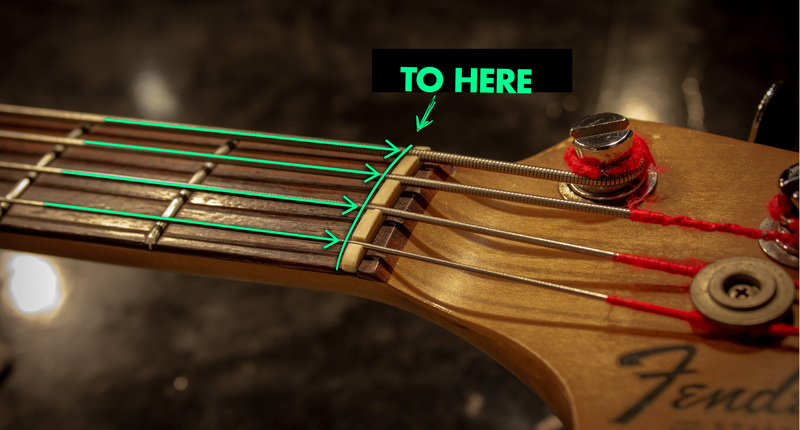 You’re aiming for the string to be long enough to pass through your bridge or body (depending on how you restring your bass) and for the wound portion of the string to then pass over the nut before the silk winding starts or the string starts to taper down. (In an ideal world you would also need the string to start to taper or for the silk to start behind the nut but before it reaches the machine heads. Sometimes this can’t always be helped, especially on the machineheads that sit closer to the nut). If the silk does start before or on the nut, it is a big no, no (see the image below). 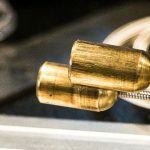 If this happens, the string simply won’t sound as it should, not to mention they may not even be long enough to reach or wrap around the posts of your machineheads. If you were to consider the scale length only (bridge saddles to nut) you are potentially neglecting a few extra inches of string that crucially need to be accounted for. For instance, some tailpieces sit further back from the saddles than others, whilst some basses need to be strung through the back of the body. These kind of features often mean the ball end resides several inches from the saddles and consequently require longer sets. An example of this is the Hofner Violin ‘Beatle’ Bass. This iconic bass is described as a 30” short scale bass (bridge saddles to nut). Logically, you would assume that this bass would therefore need a ‘Short Scale’ set of strings. However, because of its trapeze-style tailpiece, the strings are anchored approximately 3-4 inches further back from the saddles. As a result of this, most “short scale” sets turn out to be a too short and medium scale sets are usually the order of the day in this instance. Under the bass string section of our website, we categorise our strings into ‘short scale sets’, ‘medium scale sets’ and so on. However, where possible, we make every effort to include the speaking length of each set from the ball end to the start of the silk winding or taper (where some strings have no silk winding). We like to quote this measurement as we believe it gives a more accurate depiction of the length of the string rather than simply being referred to as ‘Short Scale/Medium Scale/Long Scale etc.… This way our customers can take this measurement and see how it corresponds with their own bass helping make a more informed decision as to whether the string will fit or not. “If bass players run the risk of selecting a set of strings that are ‘too short’, what’s stopping me buying a longer set and just trimming them down to the length that I need? On face value, this is a logical question, and yes this can work for some people. We have a staff member here that loves Elixir strings and trims them down to fit his short scale Fender Mustang. That being said, string manufacturers will create their sets specifically for certain scale length basses and often the gauges they select are carefully chosen to help give optimum performance and playability. 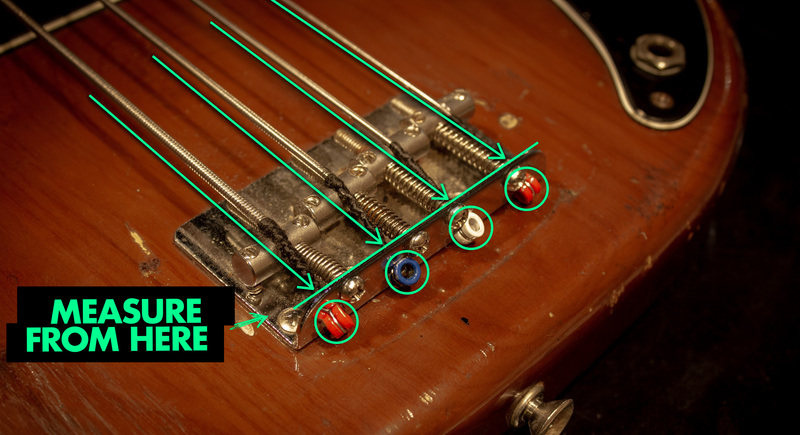 It’s also worth noting that when a set of bass strings has been created solely for a specific scale length, often the thicker gauge strings will taper at a certain point so that they can be threaded through the holes in the machineheads. This might sound crazy, but we do come across instances where some strings just won’t fit through the machineheads because they’re simply too thick. Also if you buy a longer set of strings with silk windings and cut them down, there’s a strong chance that the silk may be lost and you will have the main portion of the string travelling around the post, as opposed to the silk winding. This is particularly significant for flatwound sets. It’s important that the silk on these sets is wound around the post as opposed to the windings themselves as they can be prone to breaking if the windings become separated and the core is exposed. The bass string landscape can prove baffling at times, but we do hope that we have been able to explain the concept of scale length a bit more here. *For your information; amongst some other brands D’Addario and Rotosound also use speaking lengths to categorise their bass strings. Here’s a small table showing how their lengths compare to standard ‘Scale Length’ measurements. Notice how the lengths can also vary slightly from manufacturer to manufacturer. Thanks for that – interesting to read. Very informative, keep up the good work! Great bit of info. I have a Warwick $$ Corvette 5 string and I always struggle to get the b to fit the neck – manufactures states long scale yet on buying various long scale brands I end up trimming way to fat into the B and it hardly sits in the neck. 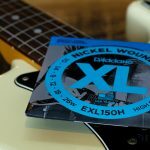 Warwick black labels strings are the only definite strings that fit. . What brands do you suggest that are for tapered long scale that might work? Hi Leon, thanks for the comments. How Long is the string from the ball end to the nut? If you let us know then we’ll be able to help you out. Hey John! Sorry for the late reply. If I remember rightly, on this bass the top four strings are standard long scale and the low B is super long. If you could measure the bass as per the directions in the blog above, I’ll be able to tell you exactly. So sorry for the delay in replying to this. Did you get in touch with us any other way…di this get sorted? I have an Ibanez Gio GSR 190 4 string bass. the speaking legnth is 35 1/2 inches while the scale length is 34 inches. can you suggest an affordable set of strings? my strings are too close to my frets and the clatter when I try to play, can you tell me what is wrong with it? Hi and thanks for the message. Sounds like you’ve just got a standard ‘Long Scale’ bass there. If you take a look at our site, you can filter out the scale length of bass strings down the left hand side. If you select ‘Long Scale’ most of the popular brands should be suitable. We try to specify the ball end to silk length on each set so as long as that exceeds your 35.5″ measurement you should be fine. With regards to your strings being too close to the frets, it could be one (or a combination of a few of the following factors). You could need more relief in the neck (this is adjusted via the truss rod). 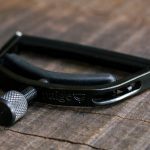 It’s a fairly standard adjustment, however, if you are at all unsure about adjusting this, we’d highly recommend getting these things looked at by your local music shop where a guitar repairer could advise you on the best way to proceed. Fret height is another thing that may need looking at. If your frets are all at different heights then one my be catching the string which would cause buzzing. Another thing that could need adjusting is your saddle and/or nut height depending on where exactly your strings are catching the frets. Without seeing the bass itself, it’s difficult to say which one of these things need addressing but I hope this has given you some ideas. Cheers – I wish I had read this before getting Rotosound RS88S’s on my Fender Mustang… I suppose the Rotosund Medium would be the correct fit for the Mustang, any opinion or fact for this? One of our guys here has a Fender Mustang bass too. If yours is the exact same sizing as his, the distance from the bridge saddles to the top nut is 30.75″ / 78cm, however, because it’s a thru-body bass, the ball end to the nut is 33.5″ / 85cm (which is the important measurement here). The Rotosound RS88S (short scale) Bass set only measures 32.5″ from the ball end to the start of the silk…with this in mind I gather that the set you bought turned out to be about 1″ short of the nut? The medium scale set measures 35.25″ from the ball end to the silk so yes this would be the correct scale length to go for. Hope this helps clear things up. If you need any more help just send me an email at lee@stringsdirect.co.uk. Yup, you’re correct about that ~1 inch short of -part. I’ll go for the medium scale set next – thanks for the fast reply and for the very clear and informative article! Hi, thanks for the informative piece. One question however, does it matter that the silk on the bridge side rests on the saddles, or doesn’t that matter as much as silk resting on the nut? I have tried a set of Rotosound 77 flats and they had the silk on the saddles. I thought it would matter to the sound and took them off. Was I wrong in that belief? No, you weren’t wrong, you ideally need the silk to end before the saddles as this would hinder the tonality and vibration of the string. If you need any further guidance, just let us know. I am thinking of buying an Ibanez 2018 GSRM20B Short Scale Bass Guitar – Walnut Flat. I will need to order the strings seperately, as I think the La Bella 0760M-S 4-String Original 1954 Fender Style Short Scale Flatwound Bass Strings seem like a good choice, but are not offered by most guitar shops. I wonder if you have any knowledge of this instrument in regard to the ball-end to nut distance ? Websites all seem to go for the scale length. Many thanks for a clear and precise article. Hi Peter, unfortunately we don’t have any direct experience of that particular model bass. The strings themselves measure 32 1/4″ from the ball end to the start of the silk and La Bella always recommend ensuring the silk winding should be wrapped around the tuning post. If the shorts are a little too short, the medium scale set measures may be more suited to your needs as these measure 34″ and the long scale set measures 36 3/4″. We hope this helps.